A highly unusual diamond wedding anniversary, an ex-wife's extraordinary gift and a smelly multi-million pound investment feature in the local papers. "So what if it's my ex?" That was the answer County Tyrone woman Sharon Traynor gave to her shocked friends when they found out she was donating a kidney... to her ex-husband. 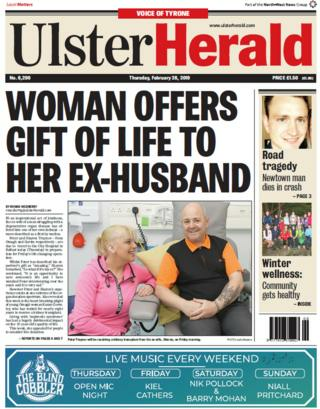 Her "extraordinary act of kindness" to her former other half makes the front page of the Ulster Herald. Peter Traynor, whose health has suffered badly from a degenerative organ disease, tells the paper he will be "eternally grateful" to Sharon. The transplant, which was scheduled for Friday, is believed to be the first time that an estranged wife has donated a kidney to her ex-husband. Inside, the Herald continues to ask questions about the former Tyrone County Hospital and the high cost to the public purse of keeping the empty building. Last week, it was revealed that the Western Health Trust had spent about £557,000 in security and maintenance on the disused hospital since its closure in mid-2017. This week, the trust tells the paper it has appointed an estate agent to sell the 20-acre site, and hopes to place it on the market "as soon as possible". 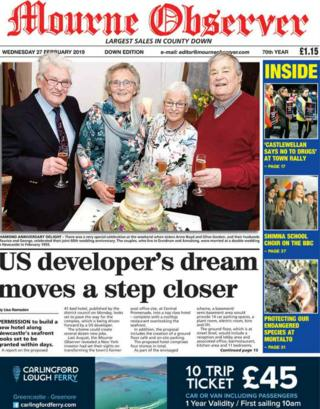 There is "double diamond delight" in the Mourne Observer as two sisters who got married on the same day 60 years ago celebrate their diamond wedding anniversaries. Anne and Olive Alexander had a double wedding ceremony in Newcastle, County Down, on 19 February 1959, marrying their respective husbands, Maurice Boyd and George Gordon. The event was so unusual the time that it made the front page of the Mourne Observer, and history has repeated itself in this week's edition. Since sharing their big day, the paper says the close couples have enjoyed many family holidays together and remain "the firmest of friends". The two families marked the special anniversary with a joint celebration at the Slieve Donard Hotel, which also hosted their wedding reception all those years ago. The Mourne Observer leads with plans to develop a new, rival hotel overlooking Newcastle's seafront. The proposed 41-bed hotel will be sited in the town's former post office on Central Promenade, if planning permission is granted. An Ulster Unionist councillor is kicking up a stink on the north coast, complaining about a "disgusting stench" from Ballycastle's new multi-million pound waterworks. 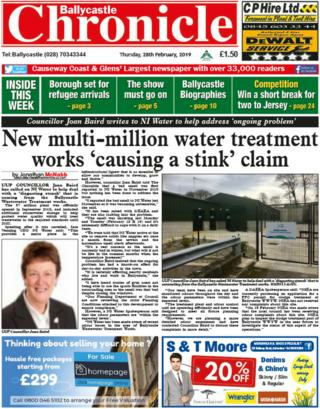 The state-of-the-art facility opened last year at a cost of £7m, but Councillor Joan Baird tells the Ballycastle Chronicle a "shocking" pong has been emanating from the plant for months. "I reported the bad smell to NI Water last November as it was becoming unbearable," she says, claiming nothing has been done to clear the air. NI Water says it has visited the site in response to complaints but insisted that the "odour parameters were within the expected levels". Inside, the Chronicle reports on a plan to resettle Syrian refugees in the Causeway Coast and Glens area for the first time since the UK-wide programme began. People fleeing the war-torn county have been arriving in Northern Ireland at a rate of about 80 every two months, according to the report, but none have so far been housed in Causeway Coast and Glens or Mid and East Antrim council areas. The Department of Communities tells the paper that is set to change, as the resettlement programme is rolled out across the UK. Further along the north coast, Limavady environmentalists are pretty cut up about what they claim is the "wanton destruction" of an ancient woodland. 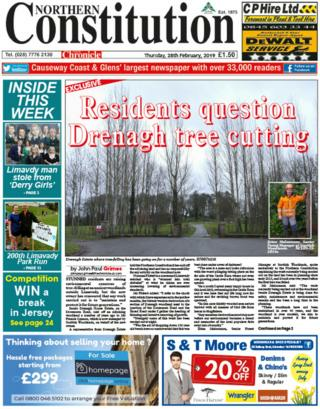 Concerned resident Norman Pickett tells the Northern Constitution that some of the tree-felling near the Drenagh House Estate has been "strangely" carried out at night. "Was the act of chopping down 100-year-old beech trees so controversial that this was best done under cover of darkness?" he asks. Scottish Woodlands, which manages the woodland, insists that the tree-cutting is for "safety, maintenance and environmental reasons". "These woodlands have not been maintained in over 40 years, and the woodland is overstocked, we aim to maintain and protect it for future generations," its senior forest manager said. There was a delicate balancing act for the future king in County Fermanagh this week. The Duke and Duchess of Cambridge visited Roscor Youth Village on the edge of Lough Erne as part of packed two-day tour of Northern Ireland. The Impartial Reporter says the couple joined local teenagers in a range of physical activities, with William chancing his luck on a balance beam. The daring duke "nearly fell" off the log at one point, but managed to stay upright to complete the challenge, telling onlookers: "I feel like Tarzan." The Reporter leads with the conviction of a former Enniskillen schoolboy who was found guilty in a "upskirting" case. Timothy Boomer was aged 14 and 15 when he took five obscene photos of two of his teachers at Enniskillen Royal Grammar School. Now 18, he was convicted of outraging public decency and will be sentenced later this month. Boomer issued an apology through a PR firm which stated: "My regrets will be with me for the rest of my life." In County Armagh, schoolteachers have issued a strong warning to parents whose children are accessing over-18 video games, such as Grand Theft Auto or Call of Duty. Hart Memorial Primary School in Portadown said it viewed exposure to such material as a very serious matter and vowed to "pursue it as a child protection issue". 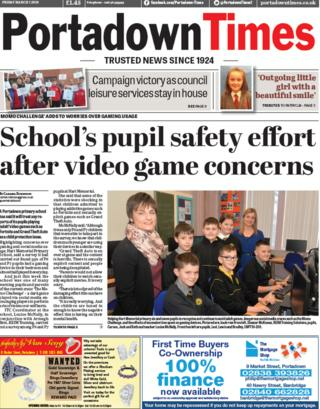 The school's ITC co-ordinator Louise McNally tells the Portadown Times that some over-18 games contained depictions of graphic violence and "sexually explicit content"
"Parents would not allow their children to watch sexually explicit movies. It is very scary," she said. In neighbouring Craigavon, the police have received "one of their more unusual scam reports," according to the Times. An unsatisfied customer called officers to complain that he had been conned into paying £200 for what turned out to be a bag of sugar. When asked for more details, the caller admitted they had been tricked out of the cash while trying to buy cocaine. "Nope, not a joke. An actual call," police said on their Facebook page. "Bizarrely, they didn't want to provide a statement!"